Do you just feel lazy going to your local gym or doing your regular exercise during the winter months? It is truly a challenge to get up from your bed and do your daily routine of exercise when the weather is so cold and the frost is convincing you to stay on your cozy bed. There are also times when you suddenly feel that your regular exercise suddenly becomes boring. But there are other activities you may try during the winter months which will definitely boost your adrenalin and ice skating is definitely one of them. Ice skating not only is exciting but also improves your balance, coordination and physical fitness. It is important to wear the right clothes when learning ice skate. Do not wear clothes that are too thick because they will get heavy once you get wet. Once your body starts to sweat, they may freeze and will make you feel colder. Wear shirts, jacket, gloves and thick leggings as these will allow you to move freely. Choosing the right skates is like choosing the right shoes for you. Make sure that they fit right. If you are a beginner, rented skates will do for you and once you have decided that you want to pursue skating, that’s the time for you to buy your own pair. When buying skates, in order to get a good fit, you should get the width of your foot while you are sitting. Your skates will feel tight and that's normal as long as they are not extremely tight. 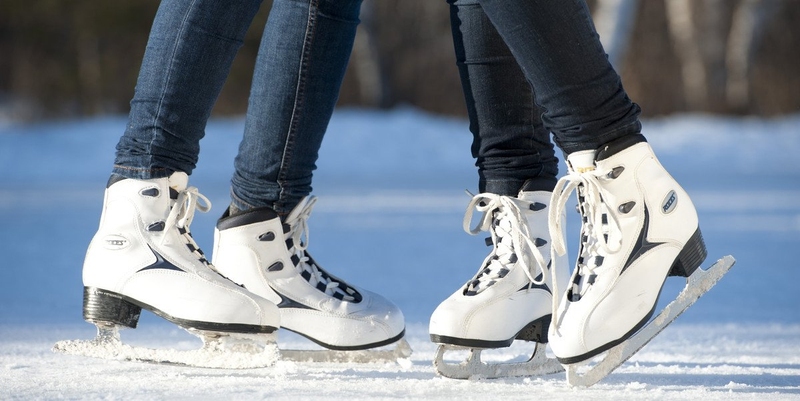 There are different brands and sizes of skates available and you may ask the advice of an experienced ice skater when choosing the perfect pair for you. Rink entrances are usually surrounded by carpets in order for customers to walk safely into it. It is advised that you walk with your rink guards on and remove them just before you step into the rink’s surface. If you are a beginner, you might need assistance while walking into the ice rink’s entrance. This is the first step in learning how to ice skate, so pluck up! When you're learning ice skate, make sure to warm up your knees by practicing the dip. Bend your knees as far as you can. Your hands and rear must be leveled. This exercise will strengthen your thighs and help you gain balance. Once you have mastered this, practice gliding while bending your knees. The ice rink is slippery and it can be a challenge for beginners to stand and glide on the ice. Hold on to the rails while trying to acclimatize yourself with the ice and then slowly let go of the rail and bend your knees a bit. Balance yourself by focusing your eyes on one point and keeping your head steady. As you start learning to ice skate, it is important for you to know how to fall and stand up from the ice. As you fall on your side, bend your knees, do the dip position and make sure to lean slightly forward. Besides, do clench your hands into fists to avoid breaking any fingers. When you have fallen, rest your hands on your lap and then turn over with your hands and knees. Put your feet one by one between your hands and when you are in the standing position, gently and slowly push yourself up. It takes some courage to learn how to ice skate, how to fall and how to stand up, but it will be worth it in the end. Once you have got yourself well prepared, it is time for you to learn how to move around the skating rink. Balance yourself, march on your place and then gently do “scooter” moves. Imagine that you are riding a scooter: place your hands in front as if you are holding on a scooter for balance, gently glide with one foot as if you are driving a scooter and then the other foot. Start with small glides until you become used to it and be able to do longer strokes. The next step is to try gliding with alternate foot. As you bend you knee, move your body with your strokes. When you're trying to glide, make sure that your skates are pointing at the same direction to go farther and faster. You may also try to add some flick in every end of your strokes because this will give your strokes more power and will make you go farther. Once you have learned how to move around with your skates, another thing you should know is how to stop without falling. When trying to stop, bend your knees inward and push one or both of your feet out. Put some pressure on the ice to prevent you from sliding. You will notice some ice sheered on your skates when making a full or partial stop. Don’t expect yourself to be a pro when you are just starting learning how to ice skate. Practice frequently and try gliding in a number eight figure. If you have enough budgets, consider enrolling in a skating class to let a professional skater teach you exclusively and give you helpful tips. You may also practice with your roller skates since the technique is just the same. This will also make your muscles familiar with the routine.